The London General Omnibus Company (LGOC) was founded in 1855 to amalgamate and regulate the horse-drawn omnibus services then operating in London. The company began producing motor omnibuses for its own use in 1909 with the X-type designed by its chief motor engineer, Frank Searle, at works in Blackhorse Lane, Walthamstow. The X-type was followed by Searle's B-type design, considered to be one of the first mass-produced commercial vehicles. 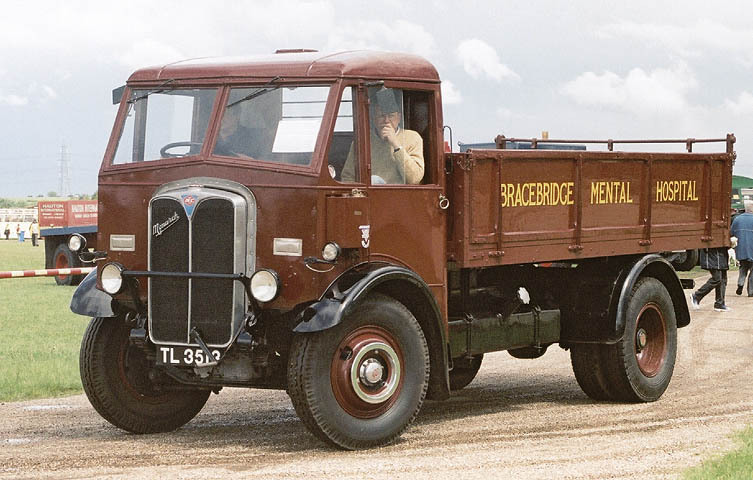 AEC's first commercial vehicle was a lorry based on the X-type bus chassis. With the outbreak of World War I in 1914, AEC's ability to produce large numbers of vehicles using assembly line methods became important in supplying the increasing need for army lorries. 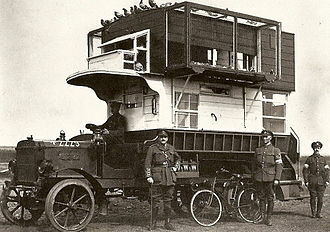 AEC began large-scale production of the 3-ton Y-type lorry, commenced in 1916, and continued beyond the end of the war. From then on, AEC became associated with both lorries and buses. In 1926, AEC and Daimler formed the Associated Daimler Company, which was dissolved two years later. 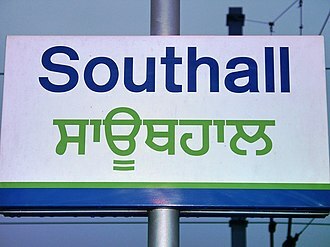 In 1927, AEC moved its manufacturing from Walthamstow to a new plant at Southall. G. J. Rackham was appointed Chief Engineer and Designer in 1928. He had previously worked for Leyland Motors. His ideas contributed significantly to AEC's reputation for quality and reliability. From 1929, AEC produced new models: the names of lorries began with "M" (Majestic, Mammoth, Mercury, and so on), and those of buses began with "R" (Regent, Regal, Renown, and so on). These original "M-models" continued in production until the end of World War II. AEC introduced diesel engines across the range in the mid-1930s. From 1931 to 1938, AEC and English Electric co-produced trolleybuses. AEC supplied the chassis, and English Electric the electric motors and control equipment. In 1932, AEC took a controlling interest in the British subsidiary of the American Four Wheel Drive (FWD) company, and began to use more standard AEC components in those vehicles. To avoid confusion, these were marketed under the name Hardy. Production ceased about 1936. Non-military production stopped in 1941, from then until 1944 AEC produced nearly 10,000 vehicles for the war effort Road Transport Archives During the war, AEC produced their 10-ton 4x4 Matador artillery tractor (an adaptation of their commercial 4x2 Matador lorry that exploited AEC's experience with the Hardy FWD venture). A 6x6 version was designated as the AEC Marshall but almost always called the Matador. To this they added the AEC Armoured Car in 1941. Other uses of the Matador chassis were the Deacon self-propelled anti-tank gun vehicle, used briefly in North Africa; and the AEC Armoured Command Vehicle, popularly known as the Dorchester. In 1946 AEC and Leyland Motors formed British United Traction as a joint venture to manufacture trolleybuses and traction equipment for diesel railcars since reduced demand would not require the existing capacity of both parents. In 1946 AEC resumed civilian production with the 0661/20 Regent II and the 0662/20 Regal I. These were not new models but a recommencement of the most basic AEC 1939 specification bus models. The single-decker was going to be marketed as Regal II until somebody at Southall remembered the 1936-8 lightweight 0862 model of that name and as a result the name was corrected after the launch publicity had been printed. At the end of 1946 the postwar 0961 RT was in build and by 1948 Mammoth Major, Matador and Monarch Mk IIIs were in production, followed by the 'provincial' Regent III and the Regal III. Also in 1948 AEC acquired Crossley Motors and the Maudslay Motor Company and on 1 October 1948 AEC set up Associated Commercial Vehicles (ACV) as the holding company for the newly acquired businesses and its own manufacturing firm, which was renamed AEC Limited. The initials AEC remained on its vehicles, with the exception of some badge-engineered versions, such as the Crossley Regent bus. In 1949 ACV acquired the bus coachbuilding company Park Royal Vehicles, along with its subsidiary Charles H Roe. Park Royal designed a new cab for the AEC Mercury in the mid-1950s, which appeared on all models across the range about this time. In 1961 ACV acquired Thornycroft. The Thornycroft name disappeared from all the vehicles except the specialist airport crash tenders, such as the Nubian, and the Antar off-road tractor unit. Production of he AEC Dumptruk was transferred to Basingstoke, and the Thornycroft six-speed constant-mesh gearbox and later nine and ten-speed range-change versions were fitted to AEC, Albion and Leyland buses and lorries. The AEC engines were used in Finnish Vanaja lorries and buses in the 1960s. 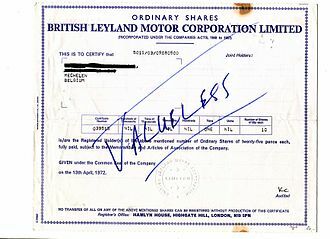 Leyland Motors acquired ACV in 1962. AEC lorries were given the same "Ergomatic" cabs used across several Leyland marques (including Albion). In 1968, all AEC double-decker buses ceased production with the completion of the last Routemasters, and its last buses, motorcoaches and lorries were built in 1979. The AEC name actually disappeared from commercial vehicles in 1977, but the Leyland Marathon was built at the Southall plant until British Leyland closed it in 1979. In 1979, the production of Leyland (AEC) vehicles was transferred to Volvo as a result of an acquisition by Volvo. ACLO (supposed to be the acronym of Associated Company Lorries and Omnibuses) was the brand name used by AEC in Latin American countries, including Brazil, and in Spain (except Portugal) to sell all their products. It seems that there was no clear reason for this badge engineering operation, although a formal request from the German AEG industrial group, which was very active in the Spanish-speaking countries, has been suggested. This is quite likely as the AEC 422 NS type exported to BVOAG Berlin was also badged ACLO. 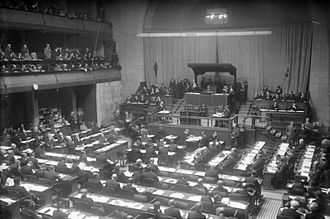 ACLOs were specially pervasive in Argentina, Uruguay and Brazil. 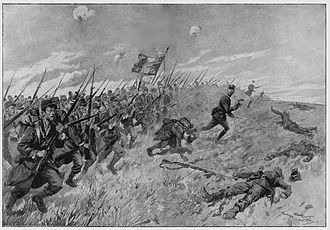 Particularly in Uruguay, there were two ACLO fleets. They were interesting buses, quite faster than Leyland Tiger in use by other fleets. It was said at the time (early '60s) that the main reason was inter-urban gearing instead of purely urban gearing present in Leylands. An interesting feature was preselector gear-change, similar to those in Leyland buses, commanded by a smallish gated lever installed by the steering wheel, with a reversed gate, with first gear to the right and up, and fourth gear to the bottom and left. In Spain, ACLOs could be seen mainly as double-deck buses in Barcelona, and as line coaches in ALSA fleet. In Portugal, the AEC vehicles, mainly coaches and buses but also lorries, were assembled and bodied by UTIC, a large coachbuilding firm based in Lisbon, and marketed under the UTIC-AEC badge, for many years. From 1971-73 the Loughborough based dealer Moseley imported nine UTIC U2043 coaches which were marketed as the Moseley Continental Tagus. They were mechanically equivalent to a rear-engined Reliance or a coach version of the Swift 691 which AEC had planned but never marketed. They were expensive to buy new and the square sided styling looked dated to British eyes in the age of the Elite and Dominant coaches, thus they were slow selling. These were probably the only right hand drive coaches built by UTIC. At the time Moseley also marketed Salvador Caetano Coaches under its own name. 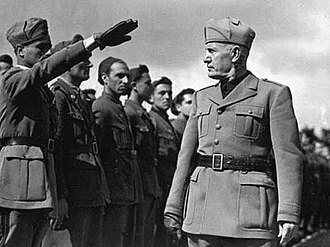 In the late 1950s, Spanish government restrictions on imports reduced AEC sales in Spain to virtually nil. As a consequence, AEC approached a Spanish truck manufacturer, Barreiros Diesel, to jointly produce buses and coaches based on AEC designs. The venture started in 1961, used Barreiros AEC as brand name, disregarding ACLO, and seemed very promising; production of the AEC off-road dump trucks being planned too. Nevertheless, the Leyland takeover in 1962 soon undermined the agreement, as Leyland was partnering with Barreiros's Spanish arch-rival, Pegaso; and eventually Barreiros looked for another collaborator in the bus arena, signing in 1967 an agreement with Belgian company Van Hool. A preserved AEC Renown, previously run by King Alfred Motor Services. The 6 ton normal-control AEC Majestic (Model 666) was introduced in 1930. The AEC Mammoth dates from the 1930s. This was a 7/8 ton lorry with a six-cylinder overhead valve engine developing 110 bhp (82 kW) on a wheelbase of 16 ft 7 in. Later a distinction was made between the Mammoth Minor (6x2, with two front axles), the Mammoth Major 6 (6x4) and the Mammoth Major 8 (8x2 or 8x4), which appeared in 1934. 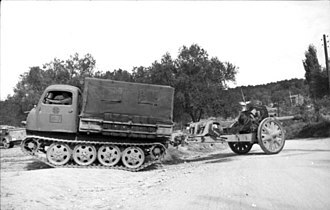 The Mammoth Major Mk II was introduced in 1935; the eight-wheeler could carry 15-ton loads. It remained in production until 1948 when it was superseded by the Mk III, which was mechanically similar, but had the Park Royal cab. The AEC Mandator dates from the 1930s. The post-war Mk II was available as a lorry and a tractor unit and the name was used for tractor units built from the 1950s to the 1970s. The original AEC Matador five-ton 4x2 commercial lorry was introduced in 1932. The name was most famously used for AEC's 4x4 Matador artillery tractor, which were known by the nickname "Mat". These vehicles exploited AEC's experience with four-wheel drive that it had gained from its involvement in the British Four Wheel Drive vehicles marketed under the name Hardy. AEC produced 9,620 artillery tractors; 514 6x6 bowsers for the Royal Air Force; 192 6x6 lorries (some of which had Coles Cranes mounted); and 185 similar vehicles, but 6x4, for mobile oxygen plants. 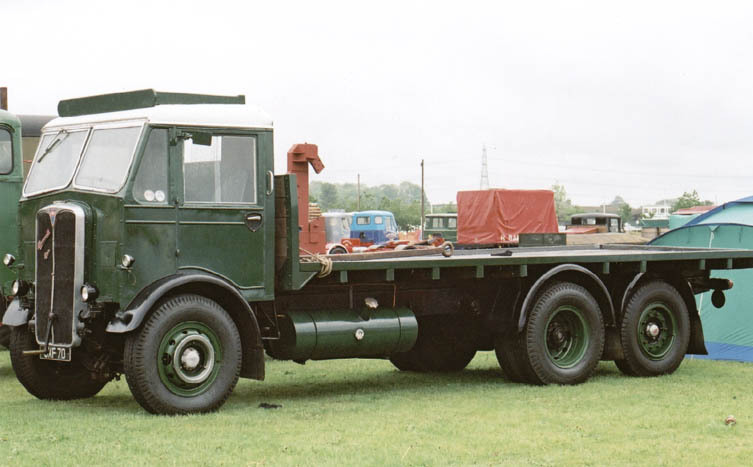 Many military Matadors were adapted for post-war commercial use, especially as timber lorries and recovery vehicles. There was a short run of the 0853 4x4 Matador in the early fifties, due to ongoing issues with the introduction of the replacement Leyland. New civilian Matadors appeared after the war. The AEC Mercury (Model 440) was first built in 1928. This was a forward-control lorry with a wheelbase of 14 ft (4.3 m) for 4 ton payloads. The Model 640 was introduced in 1930, with a four-cylinder petrol engine developing 65 bhp. 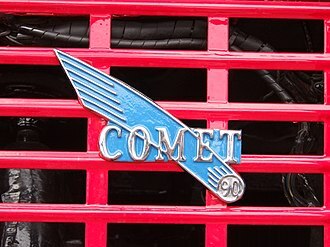 The name was resurrected for lorries built from the 1950s to the 1970s. The AEC Mogul was a normal-control tractor unit from the 1960s. The name had originally been used on Maudslay lorries. The Monarch name was resurrected for export versions of the Mercury built from the 1950s to the 1970s. AEC's first purpose-built commercial vehicle was introduced in 1916. The improved YA Type appeared in 1917. More than ten thousand of these vehicles were supplied to the War Department by 1919. Many of these were acquired by civilian operators following the war. YB and YC Types continued in production until 1921. The AEC Roadtrain was an experimental early 1930s road train. 2012 was the centenary of the founding of AEC Ltd, and to mark this, a number of events took place throughout the year. By far the biggest was hosted by The AEC Society, and was held over the weekend of 26 and 27 May 2012 at Newark Showground in Nottinghamshire. It was the biggest ever gathering of AEC's, and over 225 AEC vehicles attended as well as over 350 vehicles of other marques. It was the biggest rally ever held by The AEC Society and as well as glorious weather all weekend, was closed by a BBMF flypast. ^ "From omnibus to ecobus, 1829-1850". London Transport Museum. Archived from the original on 9 June 2007. Retrieved 3 July 2007. ^ "From omnibus to ecobus, 1919-1938, 4th page". London Transport Museum. Archived from the original on 9 June 2007. Retrieved 3 July 2007. ^ "From omnibus to ecobus, 1919-1938, 3rd page". London Transport Museum. Archived from the original on 8 June 2007. Retrieved 3 July 2007. ^ a b c Companion to Road Passenger Transport History. Walsall: Roads & Road Transport History Association. 2013. pp. 31/32. ISBN 9780955287633. ^ "Contact Us - Moseley Coach Sales". Retrieved 6 October 2014. 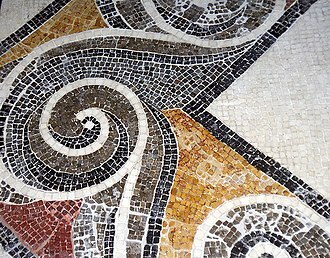 Wikimedia Commons has media related to AEC (Associated Equipment Company). The Maudslay Motor Company was a British vehicle maker based in Coventry. It was founded in 1902 and continued until 1948 when it was taken over by the Associated Equipment Company, the company was founded by Cyril Charles Maudslay, great grandson of the eminent engineer Henry Maudslay to make marine internal combustion engines. He was joined by his cousin Reginald Walter Maudslay who soon left to found the Standard Motor Company, the engines did not sell very well, and in 1902 they made their first engine intended for a car which was fitted to chain-drive chassis. The three-cylinder engine, designed by Alexander Craig was a unit with a single overhead camshaft. It was fitted with a three-cylinder engine developing 85 bhp at 450rpm, with cylinders of 9inch bore, transmission was via a 2-speed change gear. The locomotive weighed 12 tons, and was provided with a 8 hp auxiliary engine which was used to start the main engine and this was the first commercially successful petrol locomotive in the world. The three-cylinder engine was followed in 1903 by a six-cylinder version, for 1904 a range of cars was on offer, including one with a 9. 6-litre version of the six-cylinder engine. The cars were among the most expensive on the British market, as well as cars the company made commercial vehicles with the first double decker bus produced in 1905 and a range of trucks varying from small two-cylinder models to six ton models. In 1912 Maudslay supplied a 40 hp engine to power an early petrol-electric railcar, a side-valve engine was introduced in 1914. 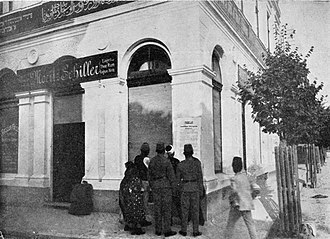 Private car production stopped with the outbreak of war, five- and six-ton lorries had been supplied to the British War Office in 1913, and these, along with a three-ton model, became the main product during hostilities. In addition, aircraft undercarriages were made, as well as reconditioning work carried out on radial engines, production of complete engines was started in 1918. Despite the advent of peace in 1918, private car building was not resumed, apart from an example of an advanced sports car. Albion Automotive of Scotstoun, Glasgow is a former Scottish automobile and commercial vehicle manufacturer. It is currently involved in the manufacture and supply of Automotive component systems, from WW1 to the 1950s, Albion had rivalled Foden for the reliability and ruggedness of their trucks. Albion was incorporated into Leyland Motors in 1951, and merely became a badge for their smaller lines, the badge was dropped by British Leyland in 1980. Today the company is a subsidiary of American Axle & Manufacturing and it is Scotlands best known name in the motor industry. Albions were renowned for their slogan Sure as the Sunrise, the factory was originally on the first floor of a building in Finnieston Street and had only seven employees. In 1903 the company moved to new premises in Scotstoun, the Albion Motor Car Company Ltd was renamed Albion Motors in 1930. In 1951, Leyland Motors took over, after the British Leyland Motor Corporation was founded in 1968, production continued with the Albion Chieftain, Clydesdale & Reiver trucks and the Albion Viking bus models. Production of these was moved to the Leyland plant at Bathgate in 1980. In 1969, the took over the neighbouring Coventry Ordnance Works on South Street. 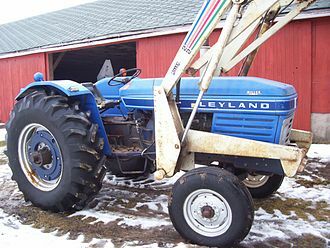 Leyland dropped the Albion name when the name was changed to Leyland. A management buy-out in 1993 brought Albion Automotive as it was known back into Scottish ownership. A new owner, the American Axle & Manufacturing Company of Detroit, Michigan, in 1900 they built their first motor car, a rustic-looking dogcart made of varnished wood and powered by a flat-twin 8hp engine with gear-change by Patent Combination Clutches and solid tyres. In 1903 Albion introduced a 3115 cc 16 hp vertical-twin, followed in 1906 by a 24 hp four, one of the specialities the company offered was solid-tired shooting-brakes. During World War 1 they built for the War Office large quantities of 3 ton trucks powered by a 32 hp engine using chain drive to the rear wheels, after the war many of these were converted for use as charabancs. Trucks and buses were manufactured in the Scotstoun works until 1980, the buses were exported to Asia, East Africa, Australia and South Africa. 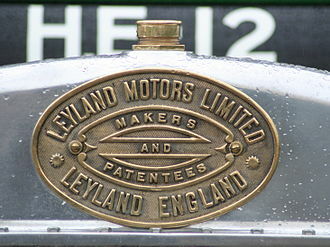 Leyland Motors Limited was a British vehicle manufacturer of lorries and trolleybuses. 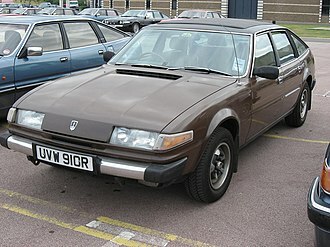 It gave its name to the British Leyland Motor Corporation formed when it merged with British Motor Holdings, British Leyland changed its name to simply BL, in 1986 to Rover Group. 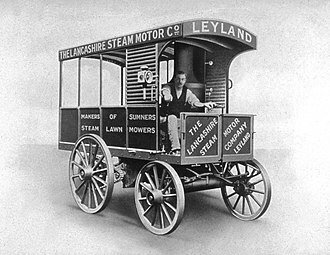 Leyland Motors has a history dating from 1896, when the Sumner and Spurrier families founded the Lancashire Steam Motor Company in the town of Leyland in North West England. Their first products included steam lawn mowers, the companys first vehicle was a 1. 5-ton-capacity steam powered van. This was followed by a number of steam wagons using a vertical fire-tube boiler. By 1905 they had begun to build petrol-engined wagons. The Lancashire Steam Motor Company was renamed Leyland Motors in 1907 when they took over Coulthards of Preston and they built a second factory in the neighbouring town of Chorley which still remains today as the headquarters of the LEX leasing and parts company. In 1920, Leyland Motors produced the Leyland 8 luxury touring car, parry-Thomas was killed in an attempt on the land speed record when the car overturned. 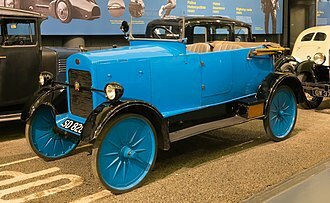 Rumours that a chain drive broke were found to be incorrect when the car was disinterred late in the 20th century as the chains were intact, at the other extreme, they produced the Trojan Utility Car in the Kingston upon Thames factory at Ham from 1922 to 1928. Three generations of Spurriers controlled Leyland Motors from its foundation until the retirement of Sir Henry Spurrier in 1964, Sir Henry inherited control of Leyland Motors from his father in 1942, and successfully guided its growth during the postwar years. Whilst the Spurrier family were in control the company enjoyed excellent labour relations—reputedly never losing a days production through industrial action, during the war, Leyland Motors along with most vehicle manufacturers was involved in war production. Leyland built the Cromwell tank at its works from 1943 as well as medium/large trucks such as the Leyland Hippo, after the war, Leyland Motors continued military manufacture with the Centurion tank. In 1946, AEC and Leyland Motors worked to form the British United Traction Ltd, in 1955, through an equity agreement, manufacture of commercial vehicles under licence from Leyland Motors commenced in Madras, India at the new Ashok factory. AEC Armoured Car is the name of a series of heavy armoured cars built by the Associated Equipment Company during the Second World War. AEC of Southall, was a manufacturer of truck and bus chassis and its Matador artillery tractor was used for towing medium field, AEC tried to build an armoured car with fire power and protection comparable to those of contemporary tanks. The first version carried a Valentine Mk II turret with 2 pounder gun, subsequent versions received a 6 pounder or a 75 mm gun. The vehicle carried two guns, smoke grenades discharger and No.19 radio set. The Mk I was first used in combat in the North African Campaign late in 1942, the Mk II and Mk III took part in the fighting in Europe with British and British Indian Army units, often together with the Staghound. The vehicle remained in service after the end of the war until replaced by the Alvis Saladin, the Lebanese Army used the car at least until 1976. Mk I, original version with turret from a Valentine tank,129 built, Mk II, heavier turret with a 6 pounder gun, redesigned front hull,158 hp diesel engine. The AEC Routemaster is a front-engined double-decker bus that was designed by London Transport and built by the Associated Equipment Company and Park Royal Vehicles. The first prototype was completed in September 1954 and the last one was delivered in 1968, the layout of the vehicle was traditional for the time, with a half-cab, front-mounted engine and open rear platform, although the coach version was fitted with rear platform doors. 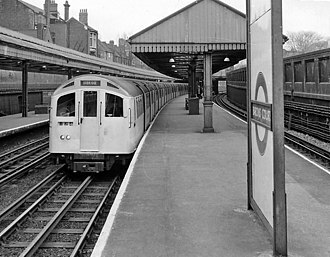 Forward entrance vehicles with platform doors were produced as was a unique front-entrance prototype with the engine mounted transversely at the rear. The first London bus route to be operated by the Routemaster was route 2, on 8 February 1956, the same bus, with a revised front end, appeared at the Lord Mayors Show in November 1956. Most Routemasters were built for London Transport, although numbers were built for British European Airways. A total of 2,876 Routemasters were built, of which 1,280 are still in existence, in modern UK public transport bus operation, the old-fashioned features of the standard Routemaster were both praised and criticised. Despite the retirement of the version, the Routemaster has retained iconic status. In 2006, the Routemaster was voted one of Britains top 10 design icons which included Concorde, Supermarine Spitfire, London tube map, World Wide Web, in the late 2000s work began on a New Routemaster bus inspired by the Routemasters traditional design. It entered service in February 2012, the Routemaster was developed between 1947 and 1956 by a team directed by AAM Durrant and Colin Curtis, with vehicle styling by Douglas Scott. The resulting vehicle seated 64 passengers, despite being three-quarters of a ton lighter than buses in the RT family, the first task on delivery to service was to replace Londons trolleybuses, which had themselves replaced trams, and to begin to replace the older types of diesel bus. The Routemaster was designed by London Transport and constructed at Park Royal Vehicles, both companies were owned by Associated Commercial Vehicles, which was taken over by Leyland Motors in 1962. It was a design and used lightweight aluminium along with techniques developed in aircraft production during World War II. Six-wheel drive is an all-wheel drive drivetrain configuration of three axles with at least two wheels on each axle capable of being driven simultaneously by the vehicles engine. Unlike four-wheel drive drivetrains, the configuration is largely confined to heavy-duty off-road and military vehicles, such as vehicles, armored vehicles. When such a vehicle only has six wheels by definition all are driven, when it has ten – with two pairs of ganged dual wheels on each rear axle as on a GMC CCKW – all are driven but the 6×6 designation remains. For most military applications where traction/mobility are considered more important than payload capability, heavy hauler and ballast tractor 6×6s have had a long history as prime movers both in the military, and commercially in logging and heavy equipment hauling both on- and off-road. Most six-wheel drive vehicles have an axle and two at the rear, or three evenly spaced in varying steering configurations. Depending on the role, the number of wheels varies between six and ten. A coach is originally a large, usually closed, four-wheeled carriage with two or more horses harnessed as a team, controlled by a coachman and/or one or more postilions. It had doors in the sides, with generally a front and a seat inside and, for the driver. The term coach first came into use in the 15th century, there are a number of types of coaches, with differentiations based on use and size. Special breeds of horses, such as the now-extinct Yorkshire Coach Horse, were developed to pull the vehicles, Kocs was the Hungarian post town in the 15th century onwards, which gave its name to a fast light vehicle, which spread across Europe. Therefore, the English word coach, the Spanish and Portuguese coche, the German Kutsche, and it was not until about the middle of the reign of Queen Elizabeth I, that coaches were introduced to England. 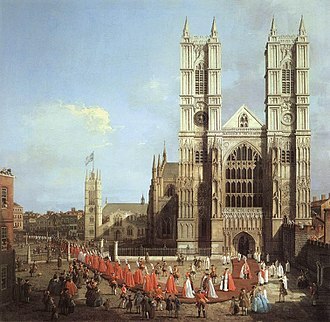 Coaches were reputedly introduced into England from France by Henry FitzAlan, a coach with four horses is a coach-and-four. A coach together with the horses and attendants is a turnout, the bodies of early coaches, as of American Concord stagecoaches, were hung on leather straps. In the eighteenth century steel springs were substituted, an improvement in suspension, a coach might have a built-in compartment called a boot, used originally as a seat for the coachman and for storage. A luggage case for the top of a coach was called an imperial, the front and rear axles were connected by a main shaft called the perch or reach. 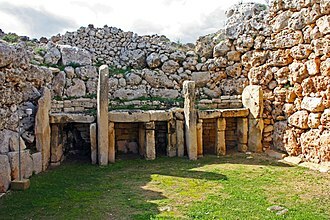 A crossbar known as a bar supported the springs. Coaches were often decorated by using a sable brush called a liner. 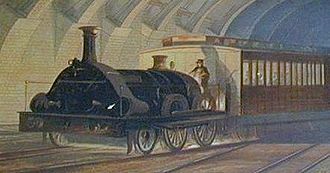 In the 19th century the term coach was applied to railway carriages, a park drag is known as a private coach as it was owned by private individuals for their own personal driving. A park drag has seats on its top and is driven to a team of four well-matched carriage horses. The principal ceremonial coaches in the United Kingdom are the Gold State Coach, Irish State Coach, the business of a coachman was to drive a coach. 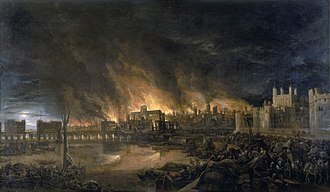 He was called a jarvey or jarvie, especially in Ireland, if he drove dangerously fast or recklessly he was a jehu (from Jehu, king of Israel, who was noted for his furious attacks in a chariot, or a Phaeton. 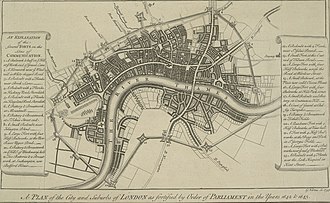 A postilion or postillion sometimes rode as a guide on the horse of a pair or of one of the pairs attached to a coach. A guard on a coach was called a shooter. Ornate detail on one of the Portuguese Royal Coaches at the National Coach Museum in Lisbon. Coaches are nowadays also used on ceremonial occasions. Here, a coach is used to convey President Guðni Th. Jóhannesson of Iceland during a state visit to Sweden. Daimler-Foster 105 hp tractor towing artillery on a trailer built by Fosters, Flanders 1917. Photo by Ernest Brooks. 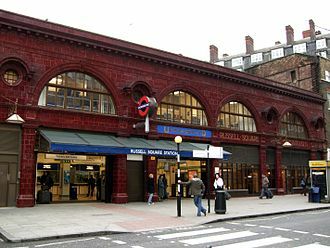 Originally built with four chimneys, Lots Road Power Station provided electricity for all of the UERL's lines. 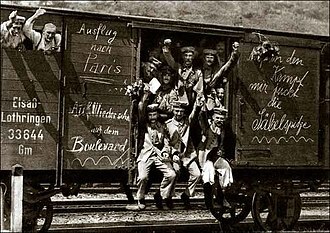 Gottlieb Daimler's railcars "tirelessly ferrying passengers around the Bremen showground as if by magic". Simms in his Motor Scout, in June 1899. AEC matador tows 3.7-inch gun, Caen, 7 August 1944. A well camouflaged command post. 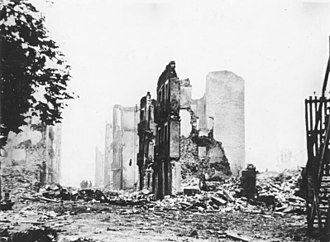 An ACV of 23rd Brigade HQ at Francolise, 14 March 1944. AEC Mk I Armoured Car.